Despite my love of fun, non-alcoholic beverages (kombucha, tea, lemonade, hibiscus coolers, etc., etc. ), I’m always dropping the ball when it comes to making them for dinner parties. Folks usually only have one option: water. But from now on, I’m going to try to up my drink game, big time. 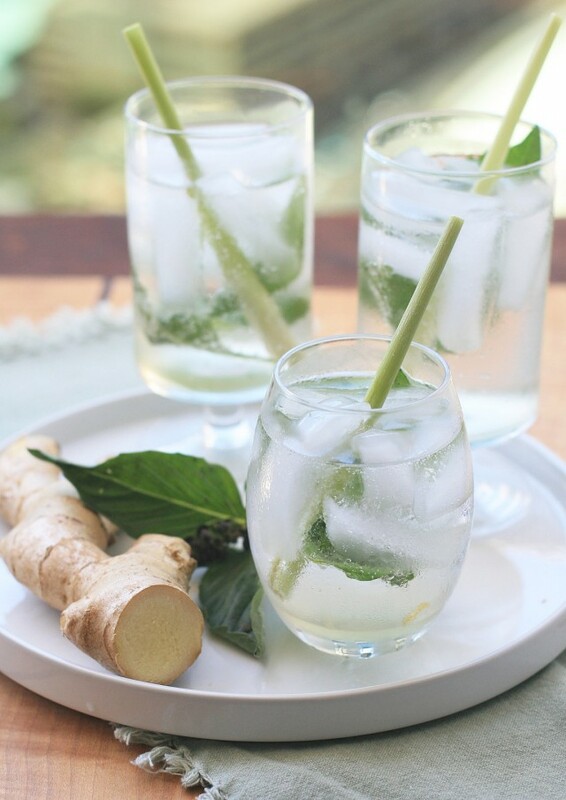 And this ginger, lemongrass and Thai basil sparkler is pretty much guaranteed to be paired with all future Southeast Asian meals. The inspiration came from a ginger and mint lemonade that a friend once made (and for you local folks, his inspiration came from the drink at Govinda’s). But since I’m in Thai mode at the moment, my mind immediately translated it into something with Asian flavors. 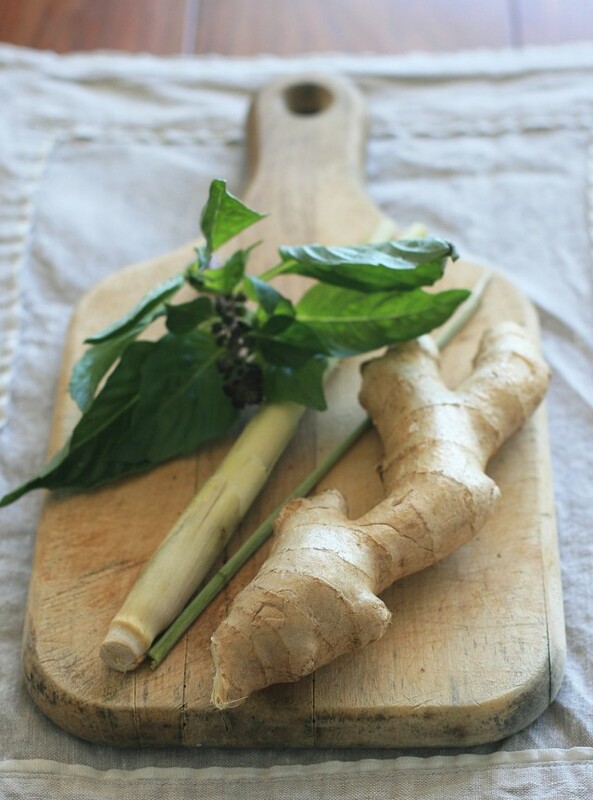 The lemon morphed into lemongrass and the mint got subbed out for spicy Thai basil. And the sparkling water? Well, I just like the bubbles. I’m really not much of a drinker these days, so I kept mine virgin. But a splash of rum or vodka would turn this into quite a boozy treat. 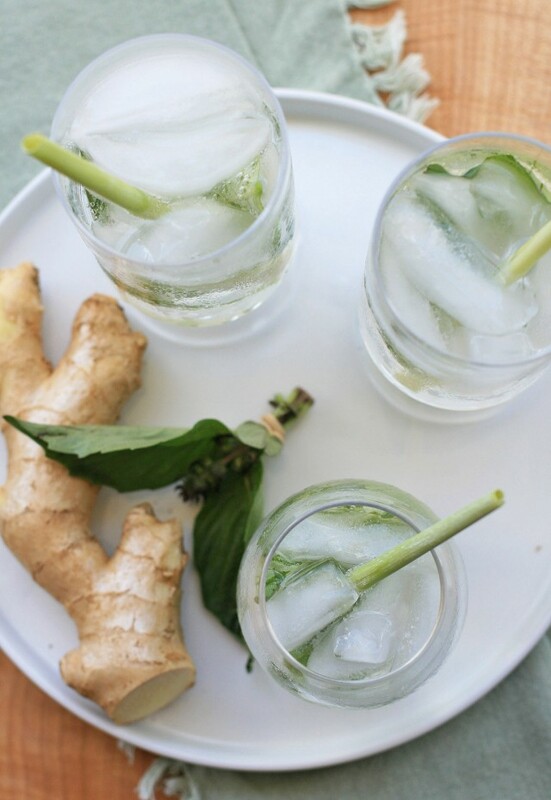 Combine the syrup and the Thai basil leaves in a tall glass. Use a wooden spoon to gently smash the basil leaves to help release their flavor. Add the ice and club soda. Stir to mix and then garnish with a lemongrass leaf, if desired.